by Chris Woodford. Last updated: August 24, 2018. Free music, news, and chat wherever you go! Until the Internet came along, nothing could rival the reach of radio—not even television. A radio is a box filled with electronic components that catches radio waves sailing through the air, a bit like a baseball catcher's mitt, and converts them back into sounds your ears can hear. Radio was first developed in the late-19th century and reached the height of its popularity several decades later. Although radio broadcasting is not quite as popular as it once was, the basic idea of wireless communication remains hugely important: in the last few years, radio has become the heart of new technologies such as wireless Internet, cellphones (mobile phones), and RFID (radio frequency identification) chips. Meanwhile, radio itself has recently gained a new lease of life with the arrival of better-quality digital radio sets. Photo: An antenna to catch waves, some electronics to turn them back into sounds, and a loudspeaker so you can hear them—that's pretty much all there is to a basic radio receiver like this. What's inside the case? Check out the photo in the box below! You might think "radio" is a gadget you listen to, but it also means something else. Radio means sending energy with waves. In other words, it's a method of transmitting electrical energy from one place to another without using any kind of direct, wired connection. That's why it's often called wireless. The equipment that sends out a radio wave is known as a transmitter; the radio wave sent by a transmitter whizzes through the air—maybe from one side of the world to the other—and completes its journey when it reaches a second piece of equipment called a receiver. Artwork: How radio waves travel from a transmitter to a receiver. 1) Electrons rush up and down the transmitter, shooting out radio waves. 2) The radio waves travel through the air at the speed of light. 3) When the radio waves hit a receiver, they make electrons vibrate inside it, recreating the original signal. This process can happen between one powerful transmitter and many receivers—which is why thousands or millions of people can pick up the same radio signal at the same time. How does this happen? The electromagnetic energy, which is a mixture of electricity and magnetism, travels past you in waves like those on the surface of the ocean. These are called radio waves. Like ocean waves, radio waves have a certain speed, length, and frequency. The speed is simply how fast the wave travels between two places. The wavelength is the distance between one crest (wave peak) and the next, while the frequency is the number of waves that arrive each second. Frequency is measured with a unit called hertz, so if seven waves arrive in a second, we call that seven hertz (7 Hz). If you've ever watched ocean waves rolling in to the beach, you'll know they travel with a speed of maybe one meter (three feet) per second or so. The wavelength of ocean waves tends to be tens of meters or feet, and the frequency is about one wave every few seconds. When your radio sits on a bookshelf trying to catch waves coming into your home, it's a bit like you standing by the beach watching the breakers rolling in. Radio waves are much faster, longer, and more frequent than ocean waves, however. Their wavelength is typically hundreds of meters—so that's the distance between one wave crest and the next. But their frequency can be in the millions of hertz—so millions of these waves arrive each second. If the waves are hundreds of meters long, how can millions of them arrive so often? It's simple. Radio waves travel unbelievably fast—at the speed of light (300,000 km or 186,000 miles per second). 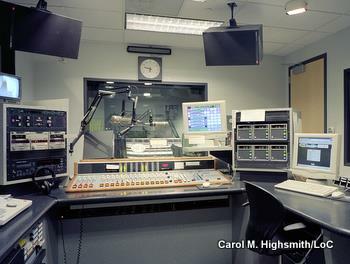 Photo: A radio studio is essentially a soundproof box that converts sounds into high-quality signals that can be broadcast using a transmitter. Credit: Photographs in the Carol M. Highsmith Archive, Library of Congress, Prints and Photographs Division. Ocean waves carry energy by making the water move up and down. In much the same way, radio waves carry energy as an invisible, up-and-down movement of electricity and magnetism. This carries program signals from huge transmitter antennas, which are connected to the radio station, to the smaller antenna on your radio set. A program is transmitted by adding it to a radio wave called a carrier. This process is called modulation. Sometimes a radio program is added to the carrier in such a way that the program signal causes fluctuations in the carrier's frequency. This is called frequency modulation (FM). Another way of sending a radio signal is to make the peaks of the carrier wave bigger or smaller. Since the size of a wave is called its amplitude, this process is known as amplitude modulation (AM). Frequency modulation is how FM radio is broadcast; amplitude modulation is the technique used by AM radio stations. What's the difference between AM and FM? An example makes this clearer. Suppose I'm on a rowboat in the ocean pretending to be a radio transmitter and you're on the shore pretending to be a radio receiver. Let's say I want to send a distress signal to you. I could rock the boat up and down quickly in the water to send big waves to you. If there are already waves traveling past my boat, from the distant ocean to the shore, my movements are going to make those existing waves much bigger. In other words, I will be using the waves passing by as a carrier to send my signal and, because I'll be changing the height of the waves, I'll be transmitting my signal by amplitude modulation. Alternatively, instead of moving my boat up and down, I could put my hand in the water and move it quickly back and forth. Now I'll make the waves travel more often—increasing their frequency. So, in this case, my signal will travel to you by frequency modulation. Sending information by changing the shapes of waves is an example of an analog process. This means the information you are trying to send is represented by a direct physical change (the water moving up and down or back and forth more quickly). The trouble with AM and FM is that the program signal becomes part of the wave that carries it. So, if something happens to the wave en-route, part of the signal is likely to get lost. And if it gets lost, there's no way to get it back again. Imagine I'm sending my distress signal from the boat to the shore and a speedboat races in between. The waves it creates will quickly overwhelm the ones I've made and obliterate the message I'm trying to send. That's why analog radios can sound crackly, especially if you're listening in a car. Digital radio can help to solve that problem by sending radio broadcasts in a coded, numeric format so that interference doesn't disrupt the signal in the same way. 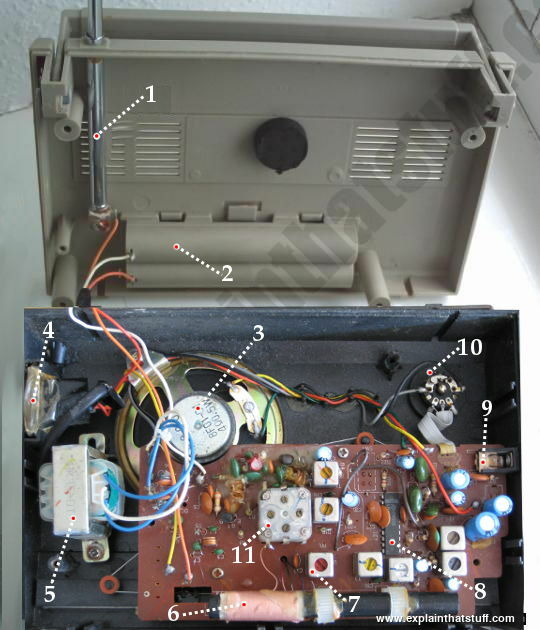 We'll talk about that in a moment, but first let's see take a peek inside an analog radio. Let's lift the lid on an old-style analog transistor radio and see what we can find inside! Click the image to see a slightly bigger photo. External, telescopic FM antenna: The one on this radio extends to about 30 cm (1 ft), which is plenty long enough to catch a good range of FM broadcasts. You can extend and swivel the telescopic antenna for better reception. Generally speaking, the longer the antenna (known as an aerial in the UK), the more signals you can pick up. Battery compartment: This radio is either battery or AC powered. When you plug in an AC lead, a switch automatically cuts out the battery power. Loudspeaker: There is only one loudspeaker, so this radio can reproduce only mono sounds. Generally, the bigger the loudspeaker the louder the radio (and the better the quality of sound it will make). AC power input: A cable plugs into this socket so you can run the radio economically from a domestic power supply (mains electricity socket). Transformer: The radio's electronic components operate on very small voltages (less than 6 volts), but the power that comes in from the AC outlet is typically 110 volts (in the USA), 240 volts (in the UK), or similar. The transformer's job is to scale down the AC voltage so it's safe and appropriate for the radio's delicate components. Transformer: A series of smaller transformers help the radio hone in on just the station you want by blocking out other, nearby stations. Amplifier: This small chip boosts the signal strength so it's powerful enough to drive the loudspeaker. The amplifier is based on transistors, electronic components that take in a small current and put out a much larger one—scaling it up in size. Small radios are often called "transistor radios": it was the development of the tiny transistor, from the late 1940s onward, that made it possible to pack all the components of a radio into a small portable unit. Before transistors came along, radios were typically huge wooden boxes that stood in the corner of your home, as big as an old-fashioned TV (and often even bigger). Earphone socket: You can plug a small mono earphone in here to listen in privacy. If you plug stereo headphones into the mono socket, you'll hear sound in only one of the two earpieces. Volume control: This is the back of the volume knob. Turning the volume knob adjusts an electronic component called a variable resistor or potentiometer, which increases or decreases the electric current flowing to the loudspeaker. A bigger current makes a louder sound with more volume; a smaller current makes a quieter sound with less volume. Tuning control: This is a variable capacitor that tunes the radio in to a specific station. 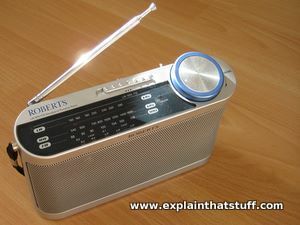 Photo: A typical Roberts DAB digital radio. The big orange button in the middle lets you pause a live radio broadcast and restart it later. You're driving along the freeway and your favorite song comes on the radio. You go under a bridge and—buzz, hiss, crackle, pop—the song disappears in a burst of static. Just as people have got used to such niggles, inventors have come up with a new type of radio that promises almost perfect sound. Digital radio, as it's called, sends speech and songs through the air as strings of numbers. No matter what comes between your radio and the transmitter, the signal almost always gets through. That's why digital radio sounds better. But digital technology also brings many more stations and displays information about the program you're listening to (such as the names of music tracks or programs). How is digital radio different from analog? Let's go back to the earlier example of sending information from a boat to the shore—but this time using a digital method. In case of emergency, I could store hundreds of plastic ducks on my boat, each one carrying a number. If I get into trouble, as before, and want to send a distress signal, I could send you an emergency coded message "12345" by releasing just the ducks with those numbers. Let's suppose I do have a problem. I release ducks with the numbers 1, 2, 3, 4, and 5—but instead of sending just five numbered ducks, I send maybe 10 or 20 of each duck to increase the chances of the message arriving. Now, even if the sea is choppy or a speedboat cuts through, there's still a high chance enough of the ducks will get through. Eventually, waves will carry ducks with the numbers 1, 2, 3, 4, and 5 ashore. You collect the ducks together and work out what I'm trying to say. 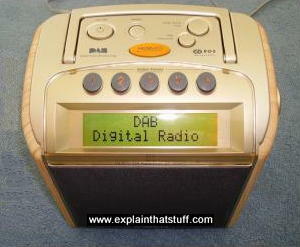 That's more or less how digital radio works! The transmitter sends program signals broken into fragments and coded in numbers (digits). The transmitter sends each fragment many times to increase the chances of it getting through. Even when things interrupt or delay some of the fragments, the receiver can still piece together fragments arriving from other places and put them together to make an uninterrupted program signal. To help avoid interference, a digital radio signal travels on a huge, broad band of radio frequencies about 1500 times wider than those used in analog radio. To return to our rowboat example, if I could send a wave 1500 times wider, it would bypass any speedboats that got in the way and get to the shore more easily. This wide band allows a single digital signal to carry six stereo music programs or 20 speech programs in one go. Blending signals together in this way is called multiplexing. Part of the signal might be music, while another part could be a stream of text information that tells you what the music is, the name of the DJ, which radio station you're listening to, and so on. 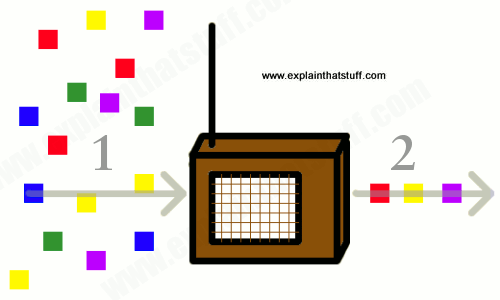 How does a digital radio receiver work? Collects fragments of radio signals flying through the air. Sorts through and reassembles the fragments in order to make a complete radio signal—and thus the program you want to hear. It takes a digital radio some time to process incoming signals—and you can hear that for yourself! Put a digital radio and an ordinary analog radio next to one another and tune them both into the same station. You'll find the sound from the digital radio lags noticeably behind the sound from the analog radio because of the time it takes to reassemble the digital signal. Give that some thought next time you set your watch by the time signal from a digital radio! Why don't radio waves all get mixed up? If you check out the US National Telecommunications & Information Administration website, you can find a very detailed poster called the United States Frequency Allocations: The Radio Spectrum Chart, showing all the different frequencies and what they're used for. If you look at the table, you'll notice that the wavelength and the frequency move in opposite directions. As the wavelengths of radio waves get smaller (moving down the table), so their frequency gets bigger (higher). But if you multiply the frequency and wavelength of any of these waves, you'll find you always get the same result: 300 million meters per second, better known as the speed of light. 1888: German physicist Heinrich Hertz (1857–1894) made the first electromagnetic radio waves in his lab. 1894: British physicist Sir Oliver Lodge (1851–1940) sent the first message using radio waves in Oxford, England. 1899: Italian inventor Guglielmo Marconi (1874–1937) sent radio waves across the English Channel. By 1901. 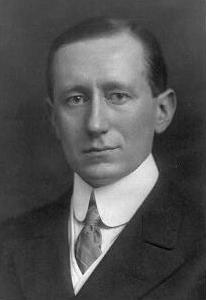 Marconi had sent radio waves across the Atlantic, from Cornwall in England to Newfoundland. 1902–1903: American physicist, mathematician, and inventor John Stone Stone (1869–1943) used his knowledge of electric telegraphs to make important advances in radio tuning that helped overcome the problem of interference. 1906: Canadian-born engineer Reginald Fessenden (1866–1932) became the first person to transmit the human voice using radio waves. He sent a message 11 miles from a transmitter at Brant Rock, Massachusetts to ships with radio receivers in the Atlantic Ocean. 1906: American engineer Lee De Forest (1873–1961) invented the triode (audion) valve, an electronic component that makes radios smaller and more practical. This invention earned De Forest the nicknamed "the father of radio." 1910: First public radio broadcast made from the Metropolitan Opera, New York City. 1920s: Radio began to evolve into television. 1947: The invention of the transistor by John Bardeen (1908–1991), Walter Brattain (1902–1987), and William Shockley (1910–1989) of Bell Labs made it possible to amplify radio signals with much more compact circuits. 1954: The Regency TR-1, launched in October 1954, was the world's first commercially produced transistor radio. Around 1500 were sold the first year and, by the end of 1955, sales had reached 100,000. 1973: Martin Cooper of Motorola made the first ever telephone call by cellphone. 1981: German radio engineers began development of what's now called DAB (digital audio broadcasting) at the Institut für Rundfunktechnik in Munich. 1990: Radio experts came up with the original version of Wi-Fi (a way of connecting computers to one another and the Internet without wires). 1998: Bluetooth® (short-distance wireless communication for gadgets) was developed. The Nobel Prize in Physics 1909: Marconi shared the 1909 prize for his radio work. You can read his own, firsthand account of radio's early development in his Nobel lecture. Keith's Radio Station: Broadcast, Satellite and Internet by John Allen Hendricks and Bruce Mims. Focal Press, 2015. The classic introduction to how radio stations work, fully updated for the Internet age. Build Your Own Transistor Radios: A Hobbyist's Guide to High-Performance and Low-Powered Radio Circuits Paperback by Ronald Quan. McGraw Hill (Tab), 2013. A detailed technical guide (not really suitable for beginners). How Radio Signals Work by Jim Sinclair. McGraw-Hill Professional, 1998. A look at the physics behind wireless communication with radio waves. The Victorian Internet by Tom Standage. Walker & Company, 2007/Bloomsbury, 2014. A more general history of how telecommunications changed during the 19th century with the development of electric power, telegraphs, and radio. Past Years: An Autobiography by Oliver Lodge. Scribner's, 1932/Cambridge, 2012. Lodge's (somewhat dry) autobiography gives details about the early history of radio and confirms that he made key breakthroughs several years before Marconi's widely reported successes. Available secondhand or in modern reprints. Crystal Fire: The Invention of the Transistor and the Birth of the Information Age by Michael Riordan and Lillian Hoddeson. New York: W. W. Norton & Co., 1998. How the invention of the transistor led to the development of portable transistor radios. Make: Electronics by Charles Platt. O'Reilly, 2015. A great starting point for kids who want to learn how to build things from electronic components. The emphasis is on learning by doing with plentiful, practical examples. "Experiment 31: One Radio, No Solder, No Power" is an easy-to-build crystal radio that can pick up AM signals even without a battery. Radio Rescue by Lynne Barasch. Frances Foster, 2000. An illustrated (fictional) story book about a book who uses amateur (ham) radio to talk to people around the world.